Johnson J, McSpadden S., Napoles A., Peringer J., Rodriquez-Salazar M., Sherman S., Stewart A. The Community of Voices (Comunidad de Voces in Spanish) was a five year research study that examined the effect of a community choir program on the health and well-being of diverse racial/ethnic and socioeconomic older adults from 2012 to 2017. University of California San Francisco’s Institute for Health & Aging collaborated with two local organizations to implement the research study: San Francisco’s Department of Aging and Adult Services (DAAS) and the San Francisco Community Music Center (CMC). The overall objective of the study was to examine the effect of participation in a community choir for maintaining the health and well-being of older adults from diverse cultural and socioeconomic backgrounds. The trial examined a comprehensive set of outcomes hypothesized to be related to choir singing and important to older adults, including cognition, physical, and psychosocial health. A cost analysis was also done. The Community of Voices program was developed using knowledge from existing research about the benefits of choir singing, community best practices, input from expert music professionals delivering choir programs for older adults in community settings, and perspectives from the senior center directors. The content of the Community of Voices program targeted three components hypothesized in the pre-existing literature to be primary pathways by which choir programs promote health and well-being for older adults: cognitive, physical, and psychosocial engagement. Each choir session included activities related to these three components, which the manual details further. 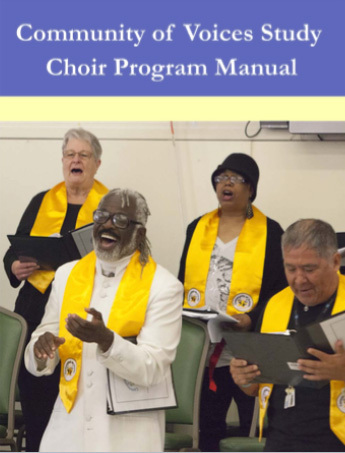 This manual describes how the study was designed and implemented, who the collaborators were, and how the Community of Voices choir program was developed and delivered – the manual is available to individually download – see View Online. Johnson J., Rodriquez-Salazar M., Sherman S., Peringer J., Napoles A., McSpadden S., Stewart A. (2018). Community of Voices Study Choir Program Manual. USA: University of California, San Francisco.